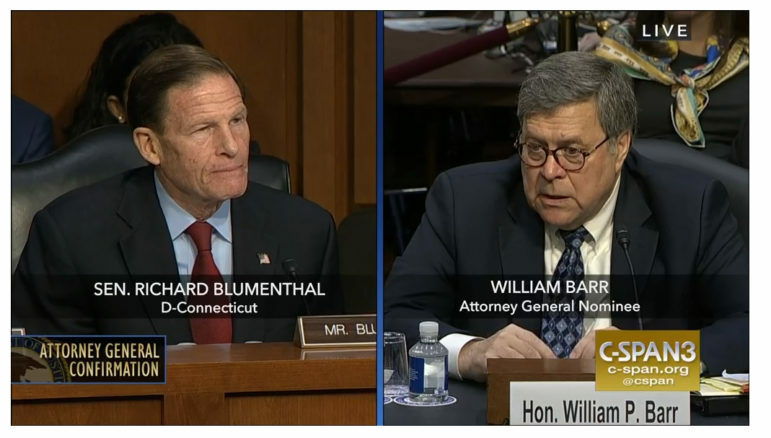 Connecticut Sen. Richard Blumenthal questioning Attorney General nominee William Barr. Washington – Sen. Richard Blumenthal on Tuesday pressed William Barr, President Donald Trump’s choice to head the Justice Department, on whether he would make all of special counsel Robert Mueller’s final report public. As he had when asked similar questions by other Democrats on the Senate Judiciary Committee during his confirmation hearing for Attorney General, Barr deflected the question during a tense exchange. “Okay, well under the current regulations, the special counsel report is confidential and the report that goes public would be a report by the attorney general,” Barr said. “Will you commit that you will explain to us any changes or deletions that you make to that special counsel report that’s submitted to you in whatever you present to us?” the Connecticut senator asked. Barr did not commit to explain to Congress “any deletions or changes” he made to Mueller’s report before it was released. Barr is Trump’s choice to replace Acting Attorney General Matthew Whitaker, whom Blumenthal and other Democrats have criticized as unfit to hold the job of the nation’s chief law enforcement officer. But Barr, who served as who served as U.S. Attorney general during the George H. W. Bush administration, also holds an expansive view of executive power, something that concerns Democrats. The nominee also holds other positions Democrats don’t like. Barr also said he supported Trump’s intention of building a border wall between the United States and Mexico and would seek to punish so called “sanctuary cities” that withhold information about undocumented immigrants who have committed crimes, even those that do not warrant reporting under current law, to federal authorities. Republicans on the panel, meanwhile, largely praised the nominee. During a break in the hearing, Blumenthal told reporters he had not made up his mind on whether he’d vote for Barr’s confirmation. “I have made no decisions whether I will vote on this nominee,” he said. To win his support, Blumenthal said Barr “has to be very specific and strong about transparency” of the Mueller report. During his questioning, Barr declined to pledge to Blumenthal that he would not intervene in the investigations into Trump being run by the Southern District of New York, the Eastern District of Virginia, and other federal courts. Republican Bob Stefanowski’s campaign for governor of Connecticut followed the same path that led other millionaire candidates like Linda McMahon and Tom Foley to flop on election day. Even though he garnered more votes than Foley, he lost the election because he could not overcome large Democrat majorities in cities like Bridgeport, Hartford, and New Haven in this year of record turnout. Now that the election is over and we have new leadership in the state, this is an ideal time to think in fresh ways about community colleges in Connecticut. As we know, the Board of Regents is currently in the process of dismantling the community college system, replacing campus leadership with temporary “CEOs” and regional presidents, and contending against all evidence — and decades of experience across the nation — that community colleges don’t need presidents. My vote for the most noble political people in Connecticut this week: the 60,000 who voted for petitioning governor candidates without succumbing to “spoiler” condescension from their families, colleagues, and friends. That nobility includes independent candidate Oz Griebel himself. He faced a lot of pressure from very well-meaning people, but Oz upheld his purpose, and stayed steadfast to the cause of so many voters who wanted him to succeed. In many ways, Connecticut’s gubernatorial race has boiled down to a referendum on taxes. Many residents feel they can’t spare another cent on taxes, especially when it doesn’t seem like it ‘comes back’ to them in any substantial way. We want to ‘save money.’ But how? ‘Tax talk,’ as I like to call it, is often convoluted at best. One candidate will say he would ‘cut taxes’ and argue that his opponent would ‘raise’ them. But then his opponent will say the very opposite. Voters are left scrambling to make sense out of what often feels like an overwhelming, convoluted heap of conflicting claims. In this chaos, it’s all too easy for us to end up voting against our own interests. During this election season The Connecticut Mirror is convening groups of people from around the state to ask their opinions on key campaign issues and their perceptions of the appropriate role of government. The participants in each group share a common circumstance or stage of life: University of Connecticut students, people with children in Bridgeport, and people who qualify as ALICE (Asset Limited, Income Constrained, Employed) in Waterbury. In this installment, we asked people living with a behavioral health challenge in the New Haven area the following question: If you could make one suggestion to the gubernatorial candidates, what would it be?